They will never initiate a probe or hold anyone to account simply because Buhari is very much aware of everything that happened. Bombing of aid workers and other civilians with them is simply fighting the Boko Haram war for them. I don’t know what else you are waiting for to know that you are being ruled by a terrorist. Sadly; many of you are waiting for Osama Bin Laden to win presidential election in Nigeria for you to know that a terrorist is in power. By the time you finish this essay of mine and still doubt this position, and then you had better prove that Boko Haram hijacked the jet or Nigeria came under terrorist attack from outside. Who said it is a mistake? The mistake started when Buhari raised a terrorist flag that belongs to nobody in Aso Rock, few weeks later, he is bombing citizens of the world. When I got the message that 52 aid workers and civilians were mistakenly bombed, I recalled that the week I wanted to raise alarm over the terrorist flag raised in Aso Rock was my scanty week. A terrorist flag has been raised by Buhari and this is a clear sign that citizens will suffer notable state sponsored terrorism. As corrupt Nigerian media were able to quote 52 casualties; believe you me that over 200 innocent aid workers and civilians lost their lives at Buhari’s command. International news platforms were able to get figures over hundred but in Nigeria; they have no respect for citizens. With the target of the jet 200 meters away from the scene of the so-called mistaken attack; one begins to wonder what is actually happening. What sort of mistake will warrant a jet dropping bombs on citizens without knowing that they are not hostile? What will warrant a jet to take off without having a target that it mistakenly and sufficiently attacked citizens and successfully killed scores? Who knows the worst Buhari has done? He killed and still killing thousands of Indigenous People of Biafra and not even aid workers and civilians in other places are spared. Buhari would not come on NTA and announce his success; 200 Boko Haram aid workers and Boko Haram civilians have been bombed. There is no head that will role for this attack against innocent citizens; as the chief commander of the armed forces, he is not even apologetic. “I commanded the jet to bomb Boko Haram and it mistakenly bombed Western aid workers” that was all Buhari had to say; is Buhari simply not fighting Boko Haram war for them? Now the clear picture of a terrorist coming out; he is gradually and evidently showing us his taste for blood. The flag that was raised in Aso Rock belongs to no terrorist group in the world and this should propel people to ask, who owns the terrorist flag flying in Aso Rock? It would cost nothing to know that only Buhari knows the owners of the flag. 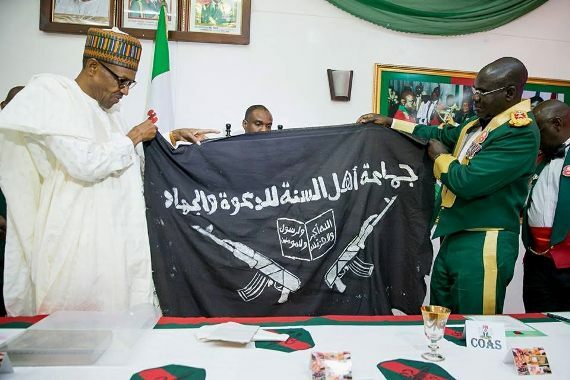 Buhari has severally been suspected to be a terrorist and with the flag flying in Aso Rock, who knows if that is not the flag of his terrorist organization that propagates jihad. 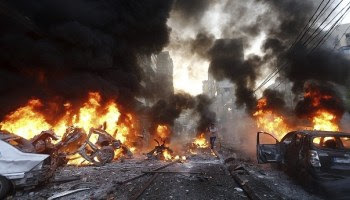 The victims of the recent State sponsored terrorist attack are mostly western aid workers Islamic terror group, Boko Haram said was against tenets of Islam. Boko Haram once said that those aid workers are used to penetrate and destroy Islamic faith. Buhari is the disaster failed Obama administration gave mankind; that disaster is manifesting and showing its true colors. A war monger has no place in democracy; Biafrans may have successfully blocked another civil war which Buhari tried so much to cause by killing thousands of unarmed and peaceful citizens of Biafra. He has continued to press on for it even with the continued illegal detention of Nnamdi Kanu; everything he is doing is to provoke the people of Biafra and get a reason to fly jets and role tanks, having denied him blood, his jets are bombing and killing citizens because he can’t do without blood. There is opportunity in Gambia; the people of Gambia will die and suffer immensely as Buhari is charging a military action against defiant Jammeh. The rate Buhari wants war is alarming and Gambians will taste his bloody nature. It is very unfortunate that ECOWAS appointed a law breaker and tyrant to mediate for peace in Gambia. How will such mediation come to fruition; Buhari always have war at the back of his mind and this is why blood will flow in Gambia. Had a democrat taken up the mediation; he would know that peaceful resolution is everything he got and not war. The life of Muhammadu Buhari is all about attacking humanity; he is attacking oppositions in Nigeria as much as he is attacking citizens in Biafra and he would attack Gambians and everything therein. He would rain bombs on Gambians as he rained on aid workers and civilians; his terrorist flag has been raised in Aso Rock and it is the dawn of terrorist attacks either by mistake or well coordinated approach. Is bombing of aid workers and civilians 200 meters away from the original target a mistake? Then if we believe is a mistake who takes responsibility? Buhari is the chief commander and any action from any sectional commander, Buhari is directly responsible for it, as a matter of fact, he must have commanded it. It would also be rational to quote that Muhammed Buhari commanded the bombing of civilians and aid workers. Had Boko Haram been the target; Buhari would not waste time to come to Nigerian National television to wave and demand applause for his command. To buttress the fact that this attack is a premeditated one carried out and commanded by Buhari; I will borrow a question and analysis from a concerned citizen. If you still doubt me; then you had better prove that Nigeria came under terrorist attack, that Boko Haram piloted that jet or hijacked it. “Bombs don’t go off jets, no matter the threat, there are rules of engagement in air strike, you fly over target areas for confirmation of threats, transmit threat level report to Air Support Command, collect data of coordinates for precision, maneuver for engagement, lock on target, request permission from Air Command to carry out offensive, you remain locked on to target until Air Command grants permission. Did the bomb fall off from its locked chambers? Was the IDP camp mistaken for a Boko Haram camp? Was the reported threat mobile or stationary? What is the identity of the pilot? Who granted the last permission for the air strike? Why was it the Army Command that made the press release of a purported accident committed by Air Force and not the Defense HQ?